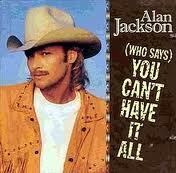 HomeRetro Single ReviewsRetro Single Review: Alan Jackson, "(Who Says) You Can't Have it All"
Retro Single Review: Alan Jackson, "(Who Says) You Can't Have it All"
“(Who Says) You Can't Have It All” is not just an average song of lost love. Rather, the loss translates into a certain resolution from a man who is the lord and master of his proverbial castle that has turned into nothing more than a lonely room with “a ceiling, a floor and four walls”, full of pictures and memories of the broken past. From the first strains of the mournful fiddle, we can almost be sure that we will be treated to a pure country song. What's more, Alan Jackson's equally forlorn voice singing the opening lyrics, “A stark naked light bulb hangs over my head/ There's one lonely pillow on my double bed”, serves as confirmation that we're in for 3 minutes and 30 seconds of a deliciously straight-up country weeper that turns out to be one of Jackson's most satisfying singles yet. Single Review: Little Big Town, "Pontoon"
Good song. I like your description as a “deliciously straight-up country weeper”. Haven’t heard “weeper” used in quite a while. Maybe the woman in this song left because he paid no attention to “What Mattered Most”. Did I mention I love this? ?